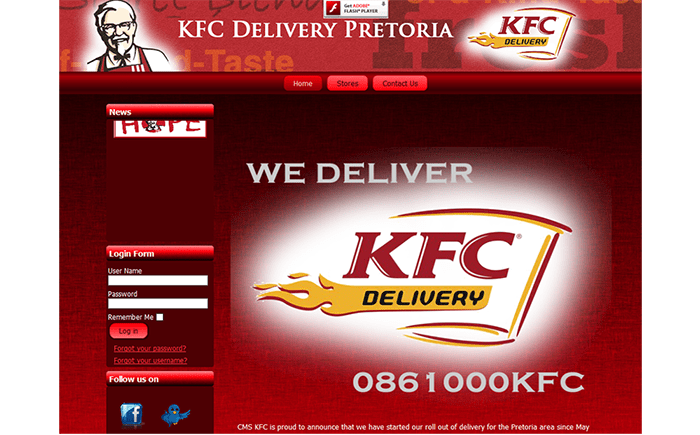 KFC delivery, a web-based application, is designed to provide efficient food delivery services to its customers residing near by to its 11 different delivery stores in Pretoria, South Africa. It is a web based application and designed by Debut infotech. Kentucky Fried Chicken, more commonly known by its initials KFC, is an American fast food restaurant chain that specializes in fried chicken. It has started their roll out of delivery service for the Pretoria area in South Africa since May 2012 and is currently working hard to widen their area of delivery services. Currently, it has 11 different delivery stores in Pretoria to deliver its delicious finger licking food to keep their customer happy at their homes. KFC delivery syncs all customer orders from their app to its web based application and help managers to manage their order status and delivery report for all the stores at one place. Customer orders can now be assigned to the delivery store around their locations. It helps them to organise their customer orders better and quicken their delivery services. From the placement of orders until they are successfully delivered, KFC delivery helps its managers to monitor their customers' orders situations in real-time.